Anyone who owns a blog or a website will want to know more about heir readers. Nothing personal, just enough information about the readers to help make the blog more appealing and useful to the readers. As with most online services, there are several choices. There is a dizzying array of web analytics tools available, with Google Analytics being one of the well known. I have been using Google Analytics for years now. Google Analytics is an enterprise level tool, very powerful, and provides a wealth of information about the visitors to a website. The information is presented in an easy to read format, and one can drill down quite far to find the required information. Its a good service and its completely free to use. Let me introduce one more. Woopra. Woopra is a fairly new entrant to the market. 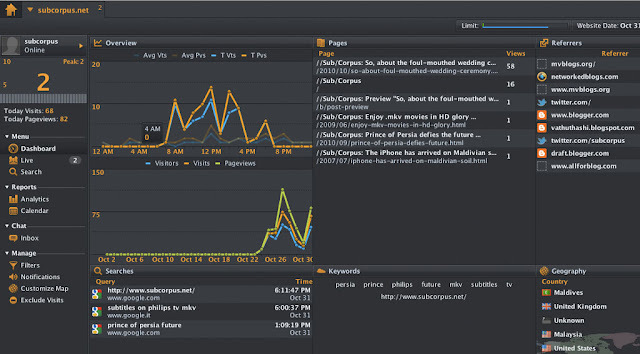 Woopra is loaded with features; features not found in most analytic tools. Unlike other analytic tools, Woopra can give you analytic information from a standalone Java program on your system (same information can also be accessed online if you want, but the interface is a bit different). The standalone program maybe the first among the traffic analytic tools and the user interface is really very nice and extremely quick. One of the most appreciated feature of Woopra is its live tracking. 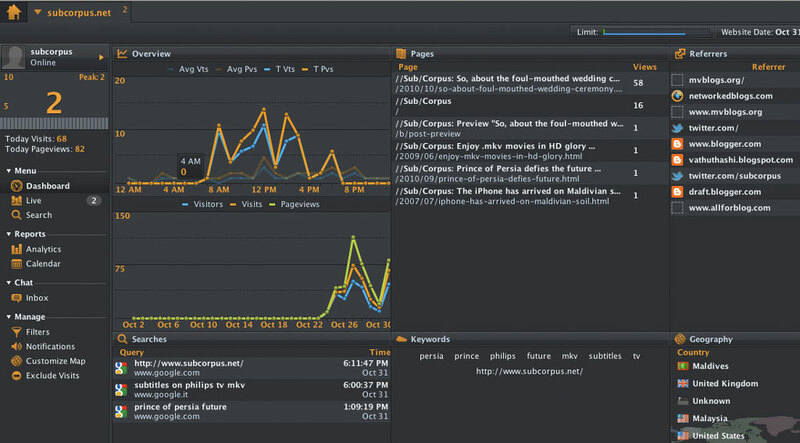 Woopra can give you real time tracking information, telling you what is happening on your website as it happens. Most online analytic tools including Google Analytics need time to process the data, delaying the information by almost 24hours at times. Woopra also has a chat feature that can be used to chat with visitors to a website. I do not know how useful this can be to a blogger or website owner. Its a little bit on the creepy side. As for me, I do not want to interact with my readers while they are on my blog reading my article. If readers wants to say something, they are more than welcome to leave a comment. I also do not want a blogger trying chat me up while I am on their blog. I signed up for Woopra when the service was invite only back in 2008. But I have to admit I did not find it all that appealing back then, and I almost forgot about it until a few weeks back, until a friend re-introduced me to the service. Woopra has come a long way, and I now use the service regularly to track visitor to my webistes and blogs. If you have not tried Woopra yet, it is totally worth checking out. The basic account is free. i signed up. too bad the free package is only for 3 months. analytics is better i guess.